The Girdwood Yoga community is grateful to Sam Norman for nurturing a space where any individual is welcomed to practice along their yoga and wellness journey. Sam is an Ayurvedic Health Counselor and a certified Yoga Health Coach. She is happily raising her daughter Marjory, born in the summer of 2017. You can learn more about how to connect with Sam at the link below. Yoga has transformed my life and continues to do so with endless routes of growth. After years of enjoying the benefits of my own practice, I knew I wanted to share my passion with others. I completed my teacher training at Anchorage Yoga in May 2014 and started teaching Vinyasa at Alyeska Resort. I also spent the summer teaching a more restorative class to my fellow guides at Chugach Adventures! I truly believe is for everyone and am excited to share this awesome practice with the people of Girdwood! My yoga journey deepened upon taking my first Forrest Yoga class in 2007. Previously I had dropped in a yoga class here and there and wondered if yoga was really for me. While I still like to explore different styles, Forrest yoga hooked me. It was a time in my life when I was beginning to make a connection between shallow breathing and holding my breath when faced with stress or anxiety. I walked into class, sat down on my mat, and was invited to notice my breath and then reminded to breath for the next 75 minutes. Ah what a relief! Also, the longer pose holds associated with Forrest yoga gave me time to truly feel the pose, feel the sensations in my body and notice the habitual thoughts running through my mind. The sensation took me by surprise and lit up my curiosity. My practice of yoga grew from a desire to be strong, flexible, calm, and feel good to an endless exploration and awakening of my inner self. I completed Anna Forrest's Foundation teacher training in March 2010 and shortly after completed the Forrest yoga mentor-ship program. Right after training I began teaching. I am happy to be able to share my love of yoga with the people of this special community. Emily Marenco was born and raised in Alaska. She currently lives in the cozy ski town of Girdwood, with her husband, two young sons and large fluffy dog. Emily began practicing yoga in the spring of 2004 at the age of 19. She attended classes on and off until the summer of 2012 when she dedicated herself to practicing yoga everyday for one year. This daily practice inspired her to enroll in a teacher-training program. She completed her 200-hour training with Anchorage Yoga in May of 2014. Emily has been teaching the Saturday Yoga I flow class at The Yoga Shack since the fall of 2017. Lauren is a born and raised Alaskan currently residing in Girdwood. She has a deep love for nature; finding fresh air to be the remedy for most things in life. Running, hiking, skiing, dancing and yoga are outlets for her energetic spirit. She has been a massage therapist since 2011, specializing in deep tissue and ashiatsu barefoot massage. She completed her yoga teacher training in Bali in 2017. Having already had a strong understanding of how the muscular body works has been an asset to her career; being able to share with her clients exercise and stretches to help strengthen and lengthen muscles. Her passion in life is health and an overall wellness for the body and wishes to share her ideas of activity in exercise, stretching, self-massage techniques and bodywork therapy. The primary focus of Lauren’s yoga classes begins with the importance of connecting your breath with movement paired with an emphasis on alignment and strength. Jule has been studying and practicing yoga since 2005; she believes "Yoga isn't a workout, but work in." Although her journey started as a purely physical one, enjoying how the postures restored & strengthened her body after wilderness adventures, the practice's more subtle aspects were unveiled during her teacher trainings & ashram experiences in India. Jule studied at Rishikish Yoga Peeth, receiving her 200 hour teaching certificate in 2012 & 300 hour certificate in 2013. In addition to her teacher trainings & additional workshops, she has found value and insight in a daily Ashtanga practice, regular pranayama & meditation, as well as restorative & yin yoga. Her teaching style encourages healthy alignment & mindful movement with breath. She enjoys sharing yoga philosophy & Ayurvedic insight during group classes. Her classes incorporate movement (asana), breath (pranayama), and awareness (chetna); hoping all yogis leave feeling physically and mentally restored with a sense of stillness in both mind and body. Jule is also an Ayurvedic Practitioner recognized by the National Association of Ayurvedic Medicine (NAMA) and has a graduate degree in Counseling Psychology from UAA. 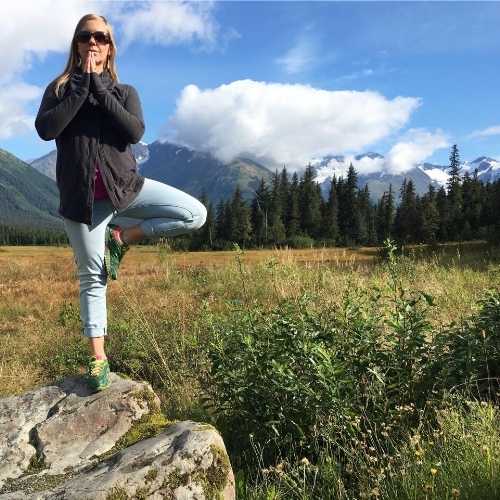 She has a private integrative counseling practice in Anchorage where she uses Ayurveda, Yoga, meditation & holistic lifestyle practices to help people experience greater states of well-being. She also teaches yoga teacher trainings & leads wilderness yoga retreats throughout the state. Check out www.ayurvedamindbody.org or www.alaskayogaadventures.com for more info! Allie just moved to Girdwood from Lake Tahoe, California. She attended her yoga teacher training in Dharmsala, India in 2015 and has been teaching yoga in the mountains ever since. Allie teaches multi-level yoga classes, specializing in yoga for athletes. She loves skiing, health and fitness, travel, the great outdoors and, most of all, sharing those things with others. Allie coaches ski racing in the winter and is an adventure travel/whitewater guide in the summer. She is also a certified personal trainer and fitness instructor. Experience Allie’s passion for life in her yoga class. 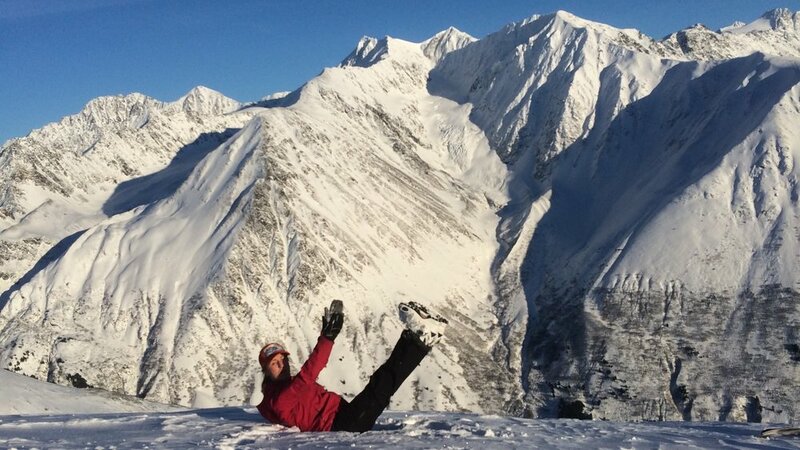 Kristina was raised in Alaska and has lived in the valley of Girdwood for the last 5-years. She is an outdoor enthusiast. She is often out on the trails with her dogs, or biking or skiing; like many of us, nature is her happy place. In the last 5 years, Kristina has found her passion in health & fitness. She was introduced to Pilates in the summer of 2018, immediately she knew this was something she wanted to practice and share with others. She completed her Pilates training in Portland through Power Pilates finishing in Oct. 2018. She is a fresh, new, passionate and challenging instructor. Jackie was born and raised in Chicago, IL, and has always had an interest in earth processes. After moving away from the big city, she cultivated a deeper connection and a love for nature after living in the mountains and spending time outdoors trail running, mountain biking, climbing and skiing. Her yoga journey began in 2009 through a love for fitness and an active lifestyle. Over the years she learned to respect yoga for it's ability to clear the mind while challenging and grounding the body. In 2018 she received 500 hour yoga teacher training in Nepal which broadened her understanding of the fundamentals of yoga outside of the practice of asanas. She enjoys the ability to connect with others through the practice and teachings of yoga. She teaches Hatha yoga focusing on anti-rhumatic movements for joint mobility, asana postures and alignment for increased flexibility and strength, breath work, and yoga philosophy.